Are you into your khakis? Unless a man is wearing them… then, no. Not really… though I’m getting sorely tempted by one of the new polishes from the Les Khakis de Chanel collection. Going all out on the sludge, Chanel knows how to hit our purses hard when leading the trends. I’m surprised by Khaki Brun… perhaps simply a clever trick to entice all those that missed out on Particuliere earlier in the year. Khaki Rose *could* be lovely, though it’s a bit granny no? Are any of these calling to you? Bored of the grungey colours now? I am surprised to read what people are willing to pay for Particulere – OPI has a couple of dupes …. They are gorgeous colours, however…I have a limit for nail polish and I just can’t fork over more than $10 for a bottle. But they are lovely colours! I can see these being extremely popular and no doubt my dashboard will be full of NOTDs but I don’t feel like me if I’m not wearing a bright colour on my nails! has a release date been confirmed? They all look very dupe-able to me. Khaki Brun looks like a possible Barry M ‘Mushroom’…Khaki Vert looks like a Models Own shade and Kahki Rose looks rather run of the mill. I can see these being popular, though! Khaki Rose is lush, but yeah, looks dupeable. yeah khaki vert is cool. The rest i’m not sure about now. I was immediately drawn to Khaki Vert due to the lovely green, (as you put it) swampy coloring 😀 Then I peered over at Khaki Rose and for a moment thought it would be nice also, but I – as you did – realized it was more of a “grandma” color to me. Same the green is a lovely army fatigue color, come to think of it,these colors remind me of a soldier’s outfit. particuliere is out of this world and no dupes can replace the very unique colour. Chanel does it again, and again – beign the trend setter. 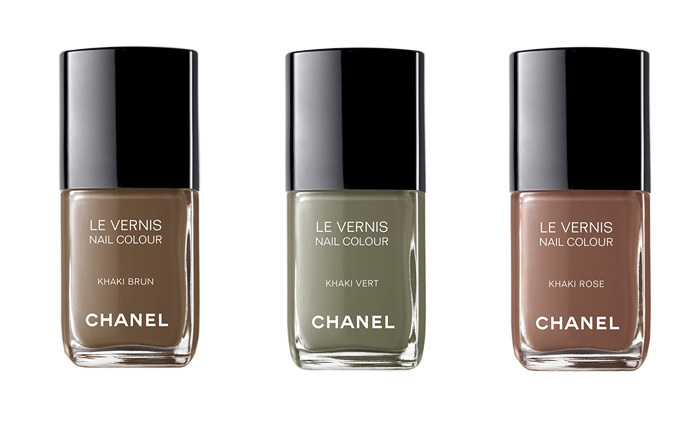 i love Khaki vert too – typical Chanel – ”has character”, grunge but elegant and classy, always…..
Khaki Vert looks gorgeous but the other two don’t really appeal to me. love’em…just trying to find a version of them that is more around the 5-10 dollar mark. but really these colour go great on wintery nails! !